This list of RIPs is based on data that has been gathered over the last two years. RIP companies come and go, merge or go bankrupt. Thus we recommend you stick with a well-known RIP. The question is whether or not the RIP you may be interested in is worthy or not. If you need to know what a RIP does, and why you need it for a large format printer, then ask for Nicholas Hellmuth92s FLAAR Report. This report contains a quick-start list of the best RIPs that we recommend, hints for what accessories you need, a list of where you can get books and training, and general information on the care and feeding of your RIP. About 80% of the people who send in e-mails asking for help with RIPs are first time users. Based on the most frequently asked questions we have prepared the following tips to help you face, and survive, the learning curve. 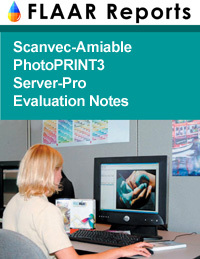 This report also includes general information for people new to large format inkjet printers. Don92t worry about not understanding what a RIP is and what it does. 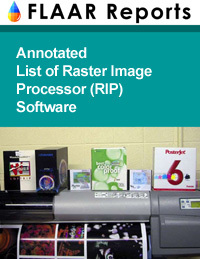 RIP (Raster Image Processor) is an unknown concept to newcomers to the world of wide format inkjet printing. 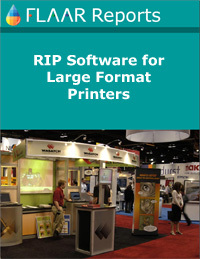 RIP is software with PostScript capability. It is basically the brain that makes a printer place the squirts of ink in the correct positions on the paper to give you a beautiful digital image. (Adobe) PostScript is software within the RIP that keeps your fonts attractively rendered without the jaggies. We ourselves were surprised at the results of this comparative review. That's what you should expect when a totally independent institute does the evaluation. Nicholas Hellmuth has dedicated himself to making arcane digital imaging hardware and software understandable to the general public. Preparing a glossary is a key ingredient in his long-range program of education. Don't let manufacturers hide behind jargon. Go behind the hype to learn what a RIP is actually supposed to do. Knowing the meaning of the jargon is a good first step to removing the mumbo-jumbo that surrounds large format digital imaging. Many RIP companies make great products that will enable you to produce wide color gamut, good color balance, and overall a sellable print which will keep your clients coming back for more. But to become a savvy buyer, it helps to arm yourself with factual information in advance. 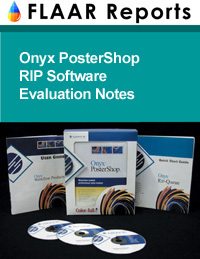 This report evaluates the Onyx PosterShop RIP. If you are the owner or operator of a production shop then you have probably either heard of or are considering to purchase, Onyx PosterShop. This is one of the few independent reviews available of this software. We also temper this evaluation with results from what actual end users have written us, especially people who own Epson printers (the RIP works also on ColorSpan, HP, Encad, and most other printers). Before you pay anyone between $2500 and $3800 (or more for a multi-user or server version), you need to get a hold of these reports. If your RIP costs less than $2500, you might want to learn from FLAAR what such an inexpensive RIP may be missing (fortunately there are two or three at reasonable cost which are full-strength; but you may not really want a lite RIP). Poster RIP, not to be confused with PosterShop RIP from Onyx. PosterJet is a German RIP, but has a distributor in the USA as well. 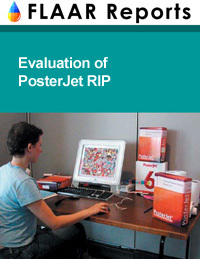 This report indicates why, when we could use any RIP made (over 70 brands of RIPs exist), why we use PosterJet. 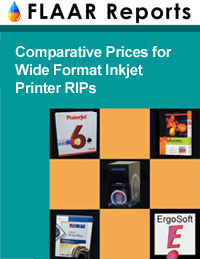 Comparative Prices for Wide Format Inkjet Printer RIPs. New November 2003. Price watch chart for RIPs, both software RIPs and hardware RIPs. Also indicates different levels of RIPs, lite, full-strength but 1-printer, full-strength multi-printer, full and server based. ColorMark Professional RIP further distinguishes itself from EFI in that the ColorSpan RIP can be upgraded. 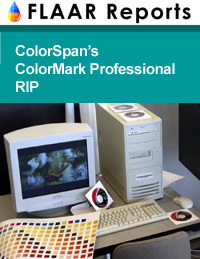 If necessary one ColorMark RIP can run several different models of ColorSpan printer. Although FLAAR has nine software RIPs available in-house, for our two ColorSpan printers we selected the turnkey ColorMark solution from ColorSpan because this way we are assured of having software that can interact with the unique aspects of a ColorSpan printer. 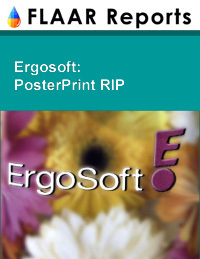 ErgoSoft comes in several strengths; the benchmarking here was of one level of the software. The evaluation is by Anne Behrnes, a graduate student research assistant in the FLAAR facility at Bowling Green State University. She has several years of pre-press experience and since working at BGSU has dedicated herself to benchmarking the leading RIP software. These introductory words are by Nicholas Hellmuth.